Aphrodisias was a small city in Caria, Asia Minor. It is located near the modern village of Geyre, Turkey, about 230 km from İzmir. Aphrodisias was named after Aphrodite, the Greek goddess of Love, who had here her unique cult image, the Aphrodite of Aphrodisias. According to the Suda, before being known as Aphrodisias, the city had three previous names: Lelegon Polis, Megale Polis, and Ninoë, The city was later renamed Stauropolis in the Christian era. 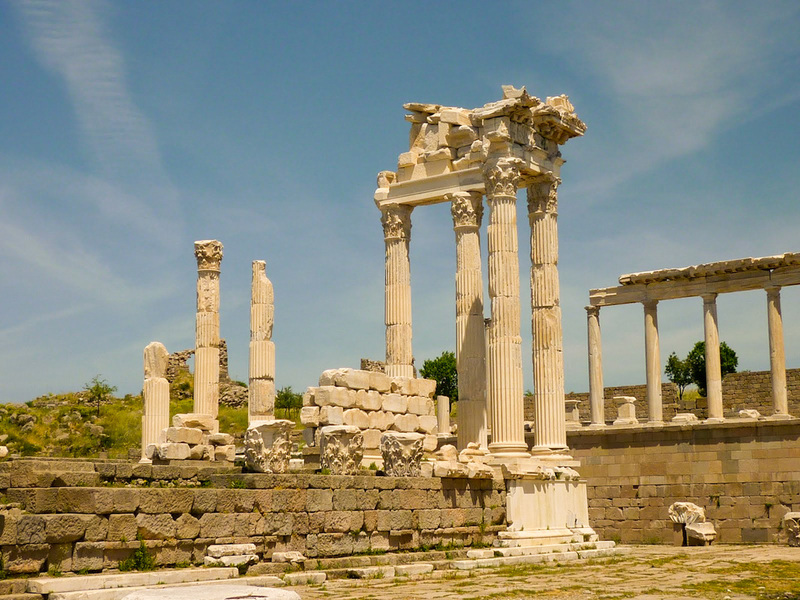 The city was built near a marble quarry which was extensively exploited in the Hellenistic and Roman periods, and sculptors in marble from Aphrodisias became famous in the Roman world. Many examples of statuary have been unearthed in Aphrodisias, and some representations of the Aphrodite of Aphrodisias also survive from other parts of the Roman world, as far afield as Portugal. The Temple of Aphrodite was and still is a focal point of the town, but the character of the building was altered when it became a Christian basilica. The Aphrodisian sculptors became renowned and the school of sculpture was very productive; much of their work can be seen around the site and in the museum. Many full-length statues were discovered in the region of the agora, and trial and unfinished pieces pointing to a true school are in evidence. Sarcophagi were recovered in various locations, most frequently decorated with designs consisting of garland and columns. Pilasters have been, found showing what are described as "peopled scrolls" with figures of people, birds and animals entwined in acanthus leaves. The sculptors benefitted from a plentiful supply of marble close at hand. We conclude the tour with a visit to the Aphrodisias Museum which displays some of Aphrodisias’ famous marble sculptures as well as the statue of Aphrodite that stood in the temple .